The BBC News website interviews David Tennant, preparing to defend the Earth from alien invasion in a special Christmas edition of sci-fi series Doctor Who. In his first full episode as the Doctor, Tennant barely has time to change out of his pyjamas before he is hunted by robot Santas, a lethal spinning Christmas tree and bloodthirsty Sycorax aliens. 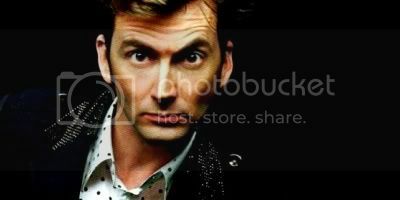 It brings to an end a busy year for Tennant, who won acclaim in dramas Blackpool and The Quatermass Experiment, took the lead in Casanova and ITV thriller Secret Smile and joined blockbuster movie Harry Potter and the Goblet of Fire. 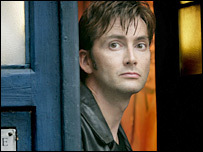 Tennant's breakthrough came after he graduated from the Royal Scottish Academy of Music and Drama. Small parts in acclaimed productions such as the 1996 movie Jude led to larger roles in films including Stephen Fry's Bright Young Things. He also appeared on stage in the Royal Shakespeare Company's Romeo and Juliet, The Rivals and The Comedy of Errors, and was nominated for a best actor Laurence Olivier Theatre Award for his 2002 performance in Lobby Hero. But time traveller Doctor Who is a dream role for the 34-year-old actor from West Lothian, who is a long-term fan of the BBC series. "It is a thrill to be part of it," he told the BBC News website. "I keep thinking 'It isn't real is it?'. It has been very curious to sit watching the titles roll with my name on them." When he replaced Christopher Eccleston in the coveted role in April, Tennant was welcomed into the job by two previous Time Lords. "I was sent good luck cards from Tom Baker and Peter Davison," he said. "They were the Doctors I grew up watching, while eating toast and drinking Tizer at home, so I was very honoured." 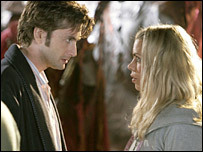 Tennant's Doctor is as courageous and unpredictable as his predecessors, but he adds a trench coat, trainers and mild Cockney accent (supposedly picked up from companion Rose Tyler) to the legacy. "Unlike other enduring characters such as Sherlock Holmes or Tarzan, being the Doctor allows you a certain freedom that is both very demanding and very thrilling," he said. "It allows you to make the character using elements of yourself." However, there is a danger of making such "open-ended" characters too quirky, he added. "You can drop yourself in it by saying 'My Doctor must always hop on a Tuesday' so you end up with this rather ugly mannerism for no good reason." He denied drawing upon other Doctors for inspiration, and said he did not discuss the role with his predecessor Eccleston. "I never set out to do certain things in the way that Tom or Chris did them," Tennant said. The Christmas special and forthcoming 13-part Doctor Who series reunites Tennant with Casanova writer Russell T Davies, who is also working on new spin-off series Torchwood. Mr Davies said it would be "marvellous" to also make a Doctor Who movie with Tennant, but added: "We are too busy to blink at the moment." Eccleston surprised viewers by leaving the role in April, having commented on the demanding filming schedule for the BBC series. Nevertheless Tennant "fully intends" to play the Doctor for at least another year. "Your social life does have to take a bit of a back seat. Even when you are not filming, there are lines to learn and scripts coming in all the time. "But it's a real thrill for me, and I do thrive on hard work." In addition to new heroes and villains, the forthcoming series will feature the return of the murderous Cybermen plus cameos from past assistant Sarah Jane Smith (played by Elisabeth Sladen) and robot dog K9. Judging from the Christmas special, the action and humour of the previous series - and the closeness between the Doctor and Billie Piper's Rose - will remain. "There is a short kiss between the Doctor and Rose, but you will have to wait and see what happens," Tennant said. "It is not safe to assume anything." 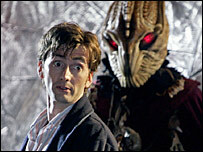 Doctor Who: The Christmas Invasion will be screened on BBC One on Christmas Day at 1900 GMT. The new series of Doctor Who will be broadcast in 2006.